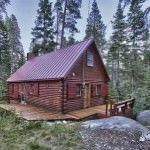 614 Glorene Ave South Lake Tahoe CA offered at $329,000TWO for the PRICE of ONE!!! Two amazing houses on one great Gardner Mountain Lot. What a unique opportunity to own two homes on one lot...Live in one and have a separate rental/guest/in law unit. Exteriors of both houses have been completely remodeled with 50 year chop roof, long lasting cement board siding, new windows, and trex decking. A trly COMPLETE down to the wiring remodel with...Continue Reading! 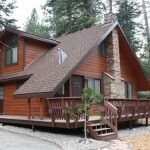 809 Mattole Rd South Lake Tahoe CA offered at $227,000Location, location. Secluded log cabin in the prestigious Spring Creek tract. Enjoy year round access just 1 mile to Baldwin Beach off Emerald Bay Road. Near bike paths, hiking. Fully furnished with custom log beds. Upgrades over the past 9 years : Forced air furnace, metal roof, decking, paint, stove, steam shower cabinets refinished, custom log mantel, log support post and more. Triple pane windows on first floor windows....Continue Reading!